Since I'm impatient, this is the start of my 'I got a sword from Maciej AKA Swordmaker' thread. 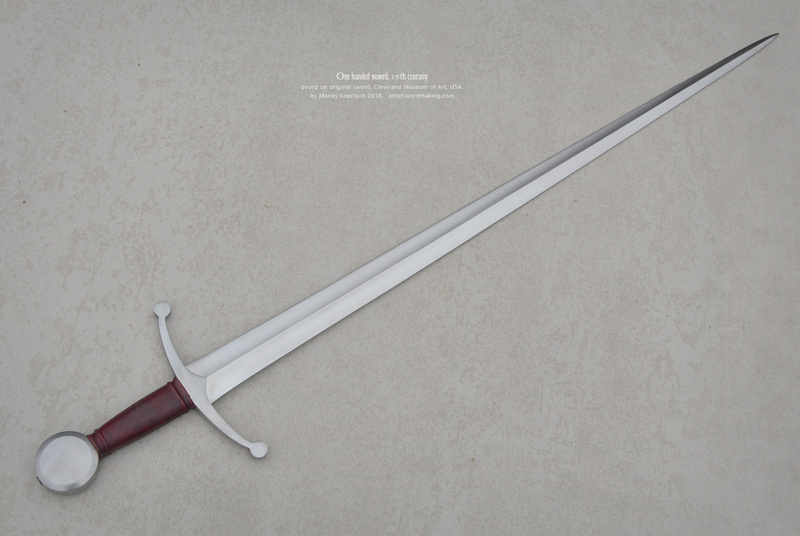 Currently it is getting its scabbard, belt etc in Poland with Maciej but the sword itself is done, and I want to share it. First off, Maciej has been great. Communicative, responsive, all that. He and I both had a number of ideas about how to turn this original into a reconstructed sword, and I've really appreciated having someone so skilled and knowledgeable working on this. I'm really happy with how it's looking and will keep you all apprised as this continues! You can see full stats and pics here:http://artofswordmaking.com/gallery/cleveland-museum-sword-15thc. Congratulations! You'll treasure it. That's a great hollow-grind and a nice, seldom seen cross guard. Cant wait to see what Maciej does with the scabbard. That looks beautiful! I like the simple elegance of it and it looks well balanced and handy in a cut an thrust sort of way. Nothing in fencing is really difficult, it just takes work. Really lovely! I've never seen a replica of that sword before. I just placed an order for Albion Sempach, but I think I have a long wait ahead of me. To my knowledge, no one has every reproduced this sword! It's one thing that made it so appealing, was having something truly unique.